NOW AVAILABLE IN BLOCK 941! The input section features the unique servo bias input circuitry with a standard TA5M type jack for use with electret lavaliere mics, dynamic mics, or line level signals. A DSP-controlled analog audio limiter is employed before the A-D converter. The limiter has a range of more than 30 dB for excellent overload protection and a dual release envelope that makes the limiter acoustically transparent while maintaining low distortion. The limiter recovers quickly from brief transients, with no audible side effects, and also recovers slowly from sustained high levels to keep audio distortion low while preserving short-term dynamics. Click here 941 band frequencies and hex codes spreadsheet. *Digital Hybrid Wireless™ is a revolutionary new design that combines 24-bit digital audio with an analog FM radio link to provide outstanding audio quality and the extended operating range of the best analog wireless systems. 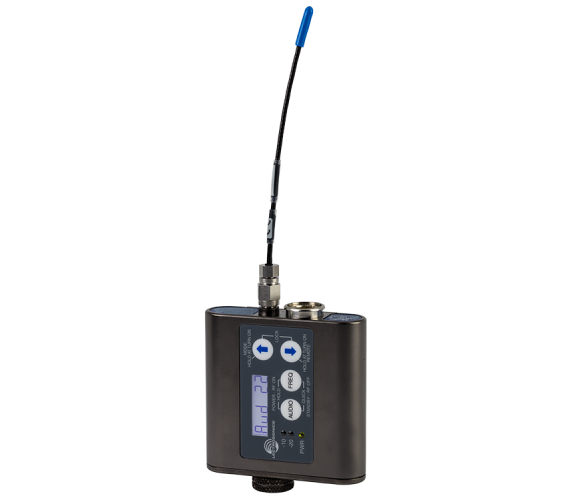 The design overcomes channel noise in a dramatically new way, digitally encoding the audio bitstream in the transmitter and decoding it in the receiver, yet sending the encoded information via an analog FM wireless link. This proprietary DSP algorithm eliminates a compandor circuit and its artifacts and preserves the RF spectral footprint of analog FM designs to simplify multi-channel coordination with existing analog wireless systems.